Students wait in line for their daily donated lunch which is part of our Feed Program. It's often these kids go hungry and don't have the energy to walk to school. The food program has helped enormously with attendance rates, as well as school performance and grades. A typical meal is Sadza (cornmeal), beans and a vegetable (generally spinach). Carla, one of our dental safari volunteers, donating school supplies to a local school during our annual Mobile Dental Safari. New school fence built at Chisuma near Victoria Falls. The students will now be able to develop a garden within the fenced area. Thanks to Imvelo Safaris, the new library Carlie Rae of Sunshine is complete. 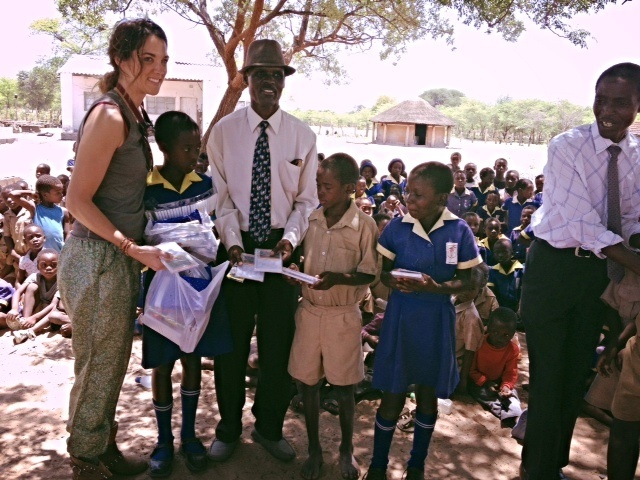 School books were donated from clients across the world. Here is one of our South African volunteers who visited our schools to run a teachers workshop for 16 teachers from both high school and junior school in the Tsholotsho area. All attendees received a suite of English teaching books, dictionaries, stationery and handouts. Dentists, Isa and Alberto, sitting in on a lesson. 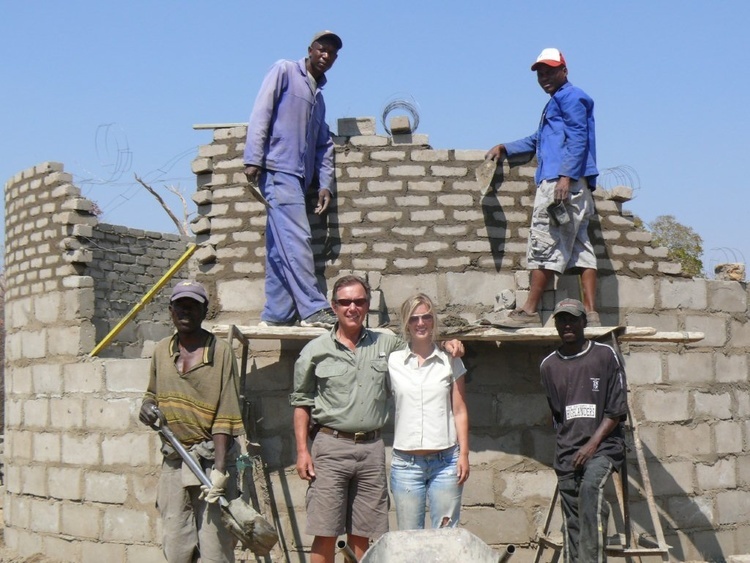 Samantha and Andy visiting Ngamo school to see construction progress. 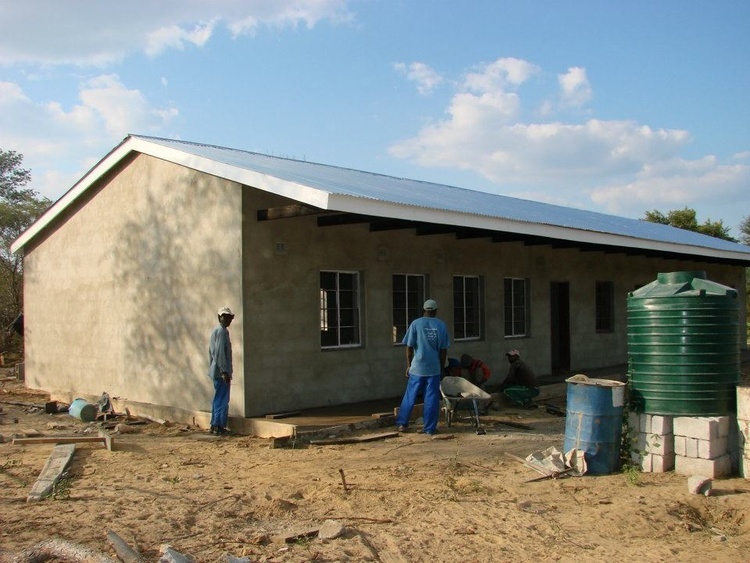 New construction on a classroom block. Local villagers are employed for the work. Final aspects of construction. It typically takes 2-4 months for completion due to material transport and labor issues. Ngamo Secondary School block after completion. Materials for construction include brick, stone, black sheeting, 26 loads of river sand, 7 loads of quarry, brick moulding, cement, window frames, air vents, trusses, wire nails, steel door frames, and paint. 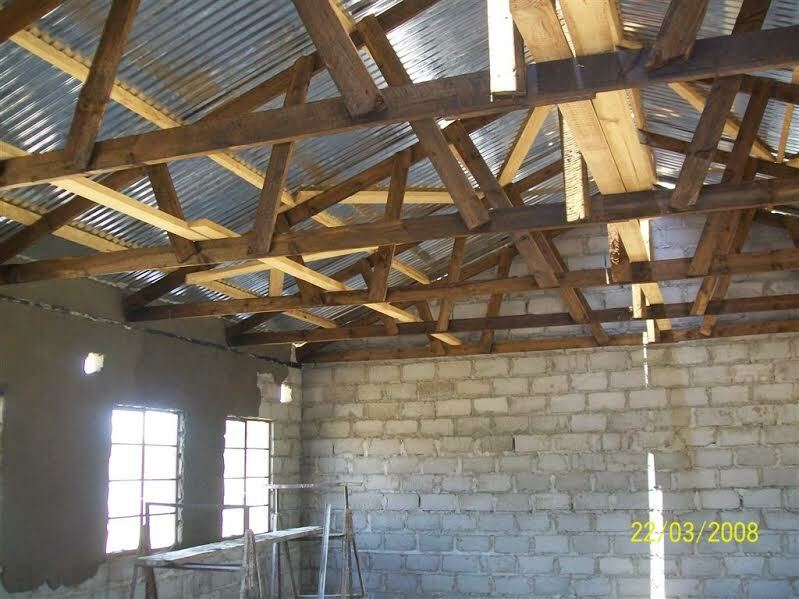 At the Sihazela Junior School, the roof trusses were eaten by termites and faced imminent collapse. The block was irreparable. New construction began in May 2014. New paint was applied in June 2014. Sihazela Junior School was completed on July 4, 2014. This is the view from the back. Ziga Junior School construction began in 2013. 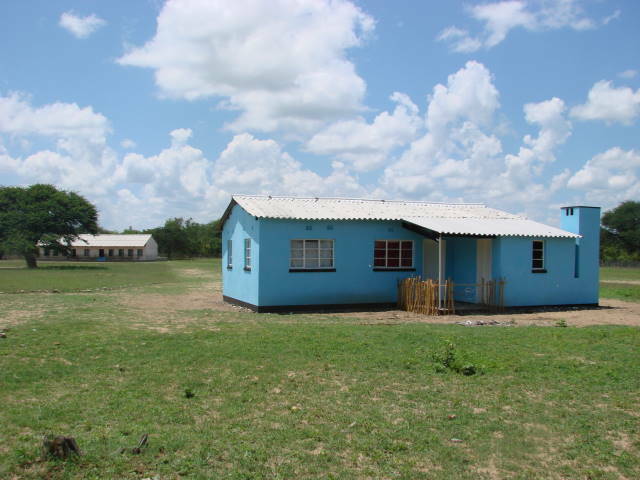 The school needed a new classroom block, as well as teacher housing. 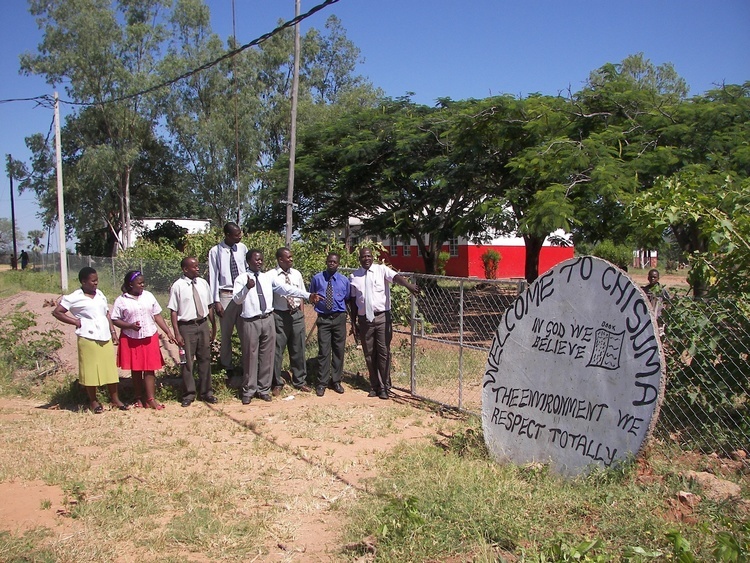 Students in front of their new building at Ziga Junior School before completion. 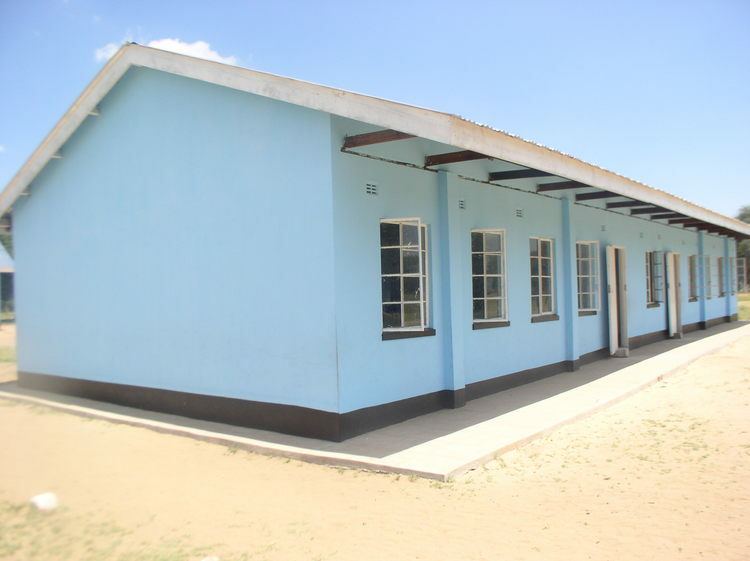 Our new classroom block that was completed in 2013 for the Ziga Junior School. Our new school block at Mtshwayeli School. We have recently supplied the classroom with steel tables and chairs. We try and use steel since it is a long lasting material. Grade 7 Girls writing exams in their new classroom. 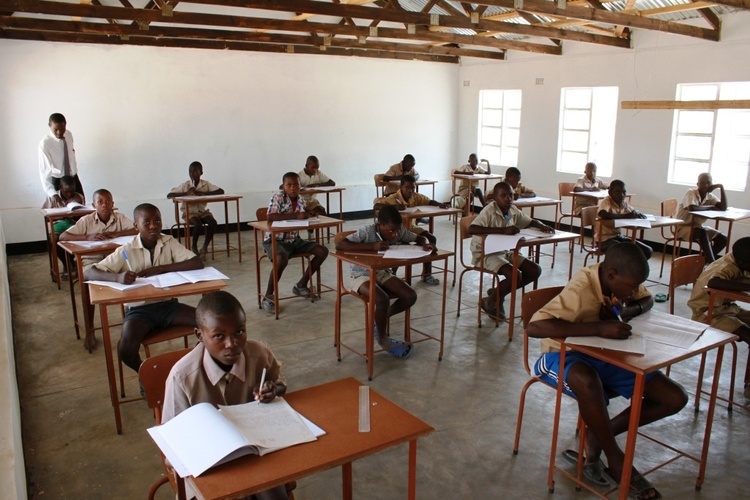 Grade 7 Boys writing exams in their new classroom. 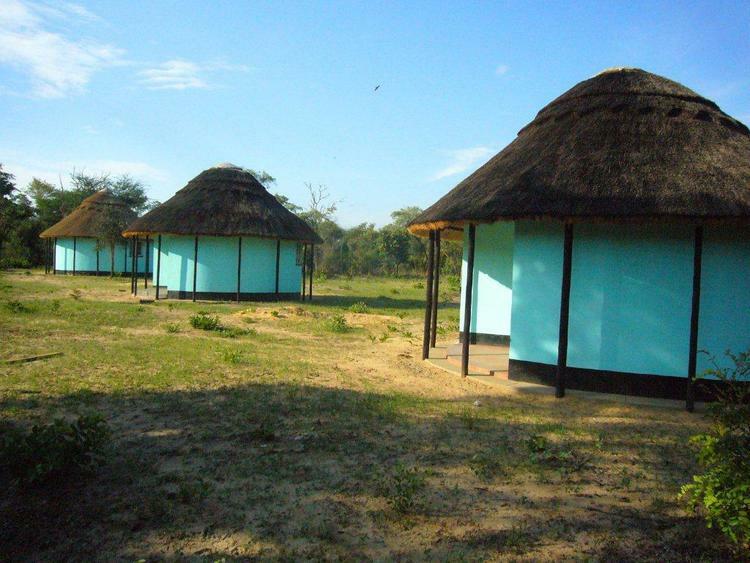 Our very new teacher cottages which are used as housing during the school year. We pay teacher incentives to encourage them to leave the city and move to the bush. It helps them endure the hardships of living so far from civilization. Teachers are also more readily available for after school tutoring for students in need. The front view of construction at Ngamo School. Teacher housing under construction at Mtshayeli Junior School. 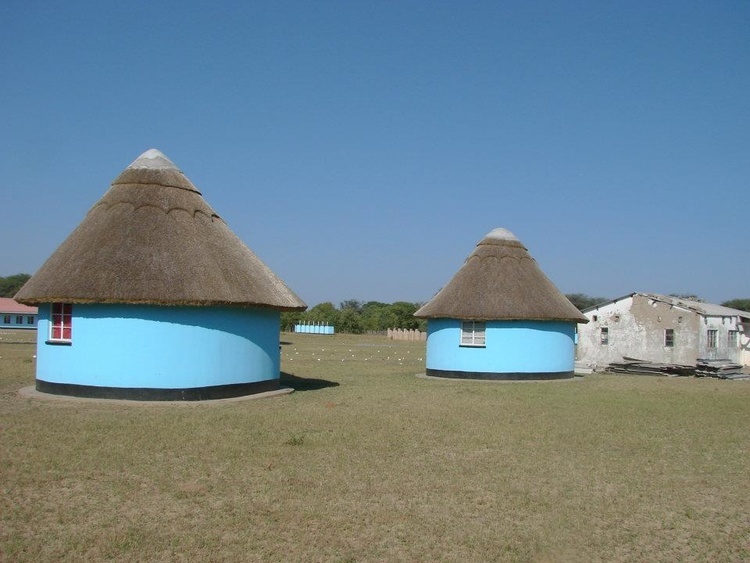 Housing complete at Mtshayeli Junior School.